am currently having a Defender 110 rebuilt. 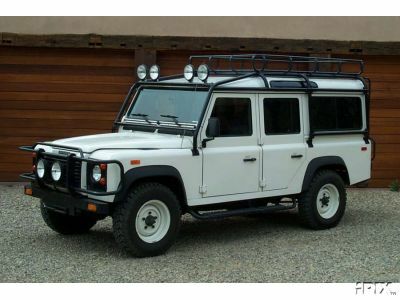 Because I have three kids, I really wanted a 4-door Defender 110 instead of the 2-door Defender 90. Rather than track down a 1993 "1 of 500" D-110, I opted to take a low mileage 1997 Limited Addition D-90 and migrate it to a 110 frame. This means some modifications have to be made, including new rear tub, rear doors, rear windows, roof, drive shaft, wiring harness, brake lines etc. This offers me the advantage of owning a much newer (and nicer) legal NAS 110--and it doesn't have to be Alpine White. For my 110, I've opted to keep the Limited Edition Willow Green. In addition, I will be adding some other goodies along the way, including an upgrade to a 4.6 liter V-8 for a little more power. Not only will this be my driver, but it also needs to be my "family car", with three rows of seats to accommodate my growing family. So rather than going with the standard 4 jump seats in the back, It will have two, forward-facing third row folding seats from Exmoor installed.